On Friday the Environmental Protection Agency announced its intention to revoke a permit issued in 2007 for the Mingo Logan Coal Spruce #1 surface mine, a unit owned by Arch Coal Inc. of St. Louis. The move is the first time the EPA has sought to block a previously permitted project, saying it is doing so because the Spruce #1 mine, the largest mountaintop removal operation ever permitted in all of Appalachia, would violate the Clean Water Act. In a letter to the U.S. Army Corps of Engineers, who issued the Spruce #1 permit in January of 2007, acting regional EPA Administrator William Early said the agency is “taking this unusual step in response to our very serious concerns” over the project’s environmental impact and probable violation of the Clean Water Act. The unprecedented action “”reflects the magnitude and scale of anticipated direct, indirect, and cumulative adverse environmental impacts associated with this mountaintop removal mining operation,” Early said. The permit would allow the mountaintop removal surface mine to operate in a watershed the EPA says contains many streams already impacted by previous mining operations. Arch Coal received the permit from the Corps of Engineers after scaling back the operation from 3,113 acres to 2,278 acres. 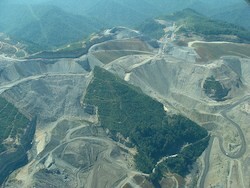 The current permit allows the mine to dump waste rock and dirt into nearly seven miles of streams. Environmental groups like the Sierra Club applauded the move (see their statement below) and, not surprisingly, Arch Coal did not, saying they were “shocked” by the EPA’s move. Company officials said the project was “the most carefully scrutinized and fully considered mine permit in West Virginia’s history,” adding that the process took nearly a decade. Last month the EPA announced a decision to hold all 79 pending mountaintop removal permits for “enhanced review,” which led to the decision to revoke the Spruce #1 permit. Regional EPA Administrator Early said he does not expect the agency to revoke any other mountaintop mine permits. The revocation of the permit is allowed under Section 404 of the Clean Water Act, giving the EPA authority to oversee and veto permits issues by the Corps of Engineers. The Spruce #1 permit veto must be formally announced in the Federal Register and opened to public comment. We are encouraged by EPA’s continued scrutiny of this permit for the largest authorized mountaintop removal operation in Appalachia. We applaud the agency for its reliance on the most recent scientific studies on water quality impacts from mountaintop removal mining, as well as its attention to the overall impacts of this and other existing and proposed mines in the immediate area. “Local residents have been actively challenging the approval of this permit at the Spruce No. 1 Mine in Logan County for more than a decade. This massive mine would have buried seven miles of streams, destroyed thousands of acres of land and disrupted local communities.